The intrepid pdq recently pointed me to this splendid wreath of snakes from Grandin Road, made especially fabulous by being motion-sensitive. If you don’t care about the motion aspect, you can make a similar wreath at a fraction of the cost. Grapevine wreaths are widely available at craft stores or online, and if you have access to grapevines you can also make your own. Rubber snakes are common novelties, especially around Halloween, so you should be able to find them at party or craft suppliers or at online retailers like Oriental Trading. Put the two together, and you’ve got yourself a wreath. The wreath at the Grandin Road site appears to be black, so you can spray-paint the wreath or leave it natural as desired. If the snakes are particularly lurid colors, you can spray-paint them black or various shades of tan and brown (make sure you use paint that won’t deteriorate the rubber). You can also get artsy and add detailing with metallic paint, hot-glue rhinestones into their eyes (or down their backs), or twine them with ribbon. 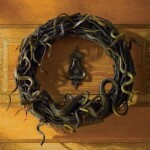 The snakes can be attached with hot glue, but a good way to fasten them more securely is to impale them on a bit of floral wire: Run a couple inches of wire inside the snake, secure the entry point with a dot of hot glue, then bend out the rest of the wire and wrap it around the vines in the wreath. Finish with a big ribbon bow or a few black silk roses. You could also expand beyond snakes and use rubber insects, fake eyeballs, or any other weird novelty item that strikes your fancy. Putting it up at Halloween is entirely optional; I see no reason why it couldn’t be left up year ’round.